John Gidding joined TLC's "Trading Spaces" in 2018 on a reboot of the popular show. Gidding has been a host and designer on HGTV's "Curb Appeal" and "Curb Appeal: The Block." He has guided many homeowners on how to improve their home's look and value. Born in Istanbul, John majored in architecture at Yale and received his master's in architecture from Harvard's Graduate School of Design. He will be appearing at the Home + Remodeling Show at Dulles Expo Center, which is being held Jan 18-21. Ask him about how to make your place look better. 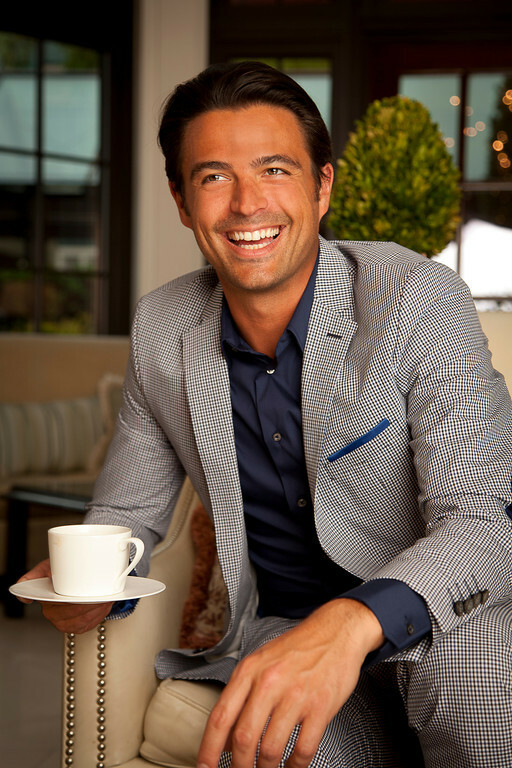 John Gidding is an architect and a landscape and interior designer who has been part of many TV design shows. Born in Istanbul, John attended American schools in Turkey and Switzerland before getting a degree in architecture from Yale and a masters in architecture from Harvard's Graduate School of Design. Gidding joined TLC's Trading Spaces in 2018 on a reboot of the popular show. He has been a host and designer on HGTV's Curb Appeal and Curb Appeal: The Block. He has guided many homeowners in improving their home's look and value. He will be appearing at the Home + Remodeling Show at Dulles Expo Center which is being held Jan 18-21. Ask him about how to make your place look better. I love the idea of a Florida Room in the basement - way to make lemonade. The key is to embrace the difficulties of a low-natural-light room. Use reflective-surface materials to maximize light bouncing around the room. Keep the walls white for most of the room but also pick an accent wall where you’ll incorporate a bright tropical wallpaper. (My friend Genevieve has some nice ones ;) Finally for plants, you’ll to find the tropical look without a big need for lights: bromeliads, ivies, or large leaved potted plants like the cast iron plant will liven up the room. Well I know some Sherwin colors that’ll do well but specifically bone and black are well represented in farrow and ball. I’m forgetting the names but they’re pricey and gorgeous. Well luckily the house is mid century - I feel like wood-on-wood is exalted in that style of home. For sure, maintain consistency of wood type and color for the whole house. There might be some clash of you find a floor color that’s too close to the golden oak color - I would skew darker or lighter, probably lighter. You can gussy the wires up with chains, but the idea is a simple one. You just need to position a cluster of pendants where they’re most needed - or position multiple pendants around the large room. The key is to pick the fixtures that make the most sense. I find with swagged pendants, the simpler the better. And most crucially: put them on dimmers. Any recommendations for coasters that look nice, don't stick to glasses, and absorb condensation? Honestly my favorite coasters are simple cork ones. I buy them in medium-bulk from amazon, they are inexpensive and I throw some away as they get used and bring out more. This is an off the wall idea but your situation somewhat calls for it - with highly different zones of vegetation. Have you ever considered Bamboo? I ask because it’s a highly visible, iconic look that can be trained (using in-ground aluminum planters) and controlled. It’s a rhizomatic plant so you don’t want to plant it without restricting its roots - it will take over the whole neighborhood eventually. But controlled, it can travel along slopes and multiple light and water levels to create a unified perimeter or feature. Love your work and your art! I'm really loving the variety of wallpapers out there right now and want to incorporate into my home. Do you suggest a smaller space like a powder room to start? With a really bold pattern and color, any advice? I love exuberant expressions in small rooms. Powder rooms are a good place to start yes - you get a lot of leeway there. I wouldn’t go super busy on the pattern unless you’ve found a pattern you’re in love with (in which case, pull the trigger!). A calm but colorful pattern will being energy in without overpowering the small room. Make sure you look at removable vinyl wallpapers, they’ve really come a long way and are easy to install yourself. Q: Area rug, wall-to-wall or wooden floor? I want to replace my burgundy wall-to-wall carpet. I dislike the color, but the carpet is still in pretty good shape. Assuming that I do something within a year, what would be the best move for re-selling? We live in a retirement community, have no small children as visitors, have no mobililty problems, have one cat as a pet. We have oriental rugs that we use on top of the wall-to wall to create separate living and dining areas. I want hardwood floors, hubby wants wall-to-wall. What would be the best choice, looking ahead at re-sale ten years or more from now? The best move for reselling is, time and again, hardwood flooring. The least successful move for selling, time cherished, is wall-to-wall carpeting. It’s a matter of wanting “new” which is hard to feel when the floors are anything but a hard surface. While it’s an investment, it usually comes back as higher sale values. I hope you have seen the HGTV Dreamhome this year in Whitefish, MT..? It is literally the answer to this question. Just enough mountain mixed with just enough modern. I believe all the furniture in that house is from Wayfair, so if there’s anything you love, you know where to find it. The key is (and Brian Patrick Flynn did this beautifully) to bring in the mountain using Art and Accent Fabrics, and let the furniture be have more neutral clean palette. Don’t forget to throw a party when you’ve completed the overhaul, every cabin needs an Apres-Ski moment. My house sits quite a bit below street level. From the street you can see over the roof of the house and beyond. It is a 1960s rambler style with an attached carport and a daylight basement. I want to make the front of the house as attractive as possible. There driveway pavement abuts the house. There is perhaps 18” of space in which to have potted plants/flowers. There are 4 windows across the front, 1 in the carport area. 3 windows are about 2ft wide and 1 is wide, about 4 ft. Any suggestions? This is a tricky situation I’ve only faced once or twice, and my solution was to create a “sunken courtyard” concept for the front of the house that embraced the landscape. We brought in boulders onto the slope so that the “landscape” could be juxtaposed to the “architecture” we then built around them in the form of steps down, decking, planters, and a front gate. These elements were made of redwood - as we were in California and that was easy to find and inexpensive. Does a major deck concept make sense for your home? My house has a spare room that my husband and I use primarily for watching TV and movies. A couch sits along one wall, and a wall-mounted TV on the other wall. My problem is with lighting this space. Currently there are floor lamps on either end of the couch. Anywhere we put a lamp, it creates a reflection in the TV screen for someone on the couch. Turning off ALL the lights makes the room very dark. I've thought about putting rope lights *behind* the TV so that it lights the wall. How do you recommend lighting a 'media room'? Hi. I am looking for whiteboard that doesn't look to officey for a small IBR with living room. I know the least expensive is the melamine? poster board which Loews or Home Depot can cut for you. Can you expound? My favorite whitewall solution was what we did on the Rachael Ray Show for the ET Offices. We purchased an extra large whiteboard “poster” that basically arrived rolled up and with easy installation instructions. You can turn the entire wall of a room into a whiteboard, then install art and marker shelves etc. right on the wall. Look online for large-scale whiteboard material in rolls. Now for a less pricey option, skewing more into the office-y look, the framed melamine whiteboards also come in smaller and differing shapes - I can imagine a gallery wall with photos and art and whiteboards might look cool. I know you love cats and so do I. Do you have any tips for dealing with litter boxes or scratching? Two very important topics for cat owners. Thanks! I not only have cats but I have PICKY cats who refused to use design-centric litter boxes. They don’t love the ones where they have to enter through a hole. My litter solution is more of a litter acceptance into my life: I buy the “lightweight” kind and change it frequently. Finally, for scratching, I stay on clipping their nails! Hi John, Love you on Trading Spaces! One thing I have always wondered is how do you guys stay on budget?? Design is super hard, and I always go over budget :-). Do you have any tips for cost cutting?? We have a rectangular basement that my husband is using to make his music office since we have no other use for it in our garage townhome. The problem is that it is also a walkway for anyone who is going in and out of the garage to the second floor (aka, me) and there is no other entrance from the garage to the stairs. I'm wondering what sort of storage solutions we can use to allow him to use the space effectively, but then also allow me to walk through with limited interruptions. Have you guys considered those wall-hung desk systems that are actually quite narrow? IKEA and the Container Store both have them and they typically install quickly and have either a narrow or fold up work surface. Advantage: modular so long spaces can be used fully. We had wallpaper put up in our entry way, along the staircase wall, and in our upper hallway some 30 years ago when we bought our house. The installer did an excellent job and it still looks nice, but really it's time to update. Can we have new wallpaper installed over the old, or is it best to have someone strip it all off and start over? We are ages 68 and 70 so this will not be a do-it-yourself job. You can absolutely wallpaper over old wallpaper - it’s a time honored tradition after all haha - but you want to make sure the old wallpaper is in good shape, as any deterioration or flocking will show through. But if it’s in relatively good shape; the pros have their methods of layering new wallpaper on top of old. Q: Bookshelves - How much Breathing Room? We are preparing to re-do our living room, where the majority of our very large book collection currently lives. We currently have some too-short (~72 inch) bookshelves and want to get taller ones to accommodate more linear feet and utilize more vertical storage in our small home. We're also planning on lining up 3 or 4 bookshelves for a library look. We have 8 ft. ceilings (thanks, post-war construction). Should we try for 84" shelves, which allow for some breathing room at the top, or try to get closer to 92", for an almost built-in look? PS I'd rather not have stuff accumulate on the top of shelves, whether it's decorative or just more books. A subtle and difficult scenario to answer without seeing the space but my inclination is that an almost-built-in look is the stronger look. It sounds like you need the shelf space - and books are wonderful decorative elements that never look like clutter to me. It’s great you have such a collection - show it off all the way up. Definitely keep breathing room as well, throughout the shelves not just along the top. What color for wood flooring. Our home is a split foyer and we are planning on putting in hardwood flooring up and down the steps and continue in the public areas of the house and maybe the bedrooms. $$$$ The sliding glass door in the rear of the house faces west and gets fantastic sunlight and the front gets eastern sunlight. I am concerned about fading the wood floors. I am planning on oak flooring with a maple stain on in that range. I fear that a darker stain would fade were the sliding glass door is located. In the winter we keep the curtains open for the sunlight. Thank you!!! A lot of the engineered hardwood flooring is fade-resistant so you should talk with your provider to find the best product if you go engineered. If you’re going with staining Oak, I’d go with a light color, both to avoid fading and because I’m a fan or blond oak floors in well lit rooms. Are there any design websites or suggestions you recommend? I moved into a new house and am attempting to determine where to place furniture. The space is bigger than I anticipated. There are so many sites out there for design help. Everything from House Beautiful (good for lists of answers to a specific design question) to DecorAid and Houseology (blog style tips) there’s a lot of expertise sloshing around out there. My best trick for furniture layouts is you need to draw out a to-scale plan of the room and cut out pieces of paper to the correct scale representing the furniture you’re moving around. Graph paper is your friend for this. I'm a big fan of your designs, interior and exterior. Glad you're back with TS. I'm about "flipped out" with endless shows on fast flips. I miss HGTV's more relatable/usable shows. Thanks so much John. Love keeping up with your new projects. And reminder to all that John will be at the Home & Remodeling Show being held Jan 18-20 in Chantilly. Next week we are continuing to talk about your stuff and how to deal with it. Blogger Joshua Becker who just published The Minimalist Home will be my chat guest. Until then, keep up the home detailing and decluttering.